I am working at a hotel in Anchorage Alaska. Work is very slow right now, and since no one else is around, I am able to chant out loud along with the audio recording. As the divine words of the chant reach my lips, delight wells up from within my heart! Thank you, Gurumayi, for this chanting tour. And thank you to every person offering seva on behalf of the tour. I set out very early this morning to buy some plants for my garden in a rural nursery on the outskirts of Buenos Aires. I took with me the Govinda Jaya Jaya CD so that I could chant while driving, and decided to take a back road for the simple pleasure of traversing the land. A deep feeling of gratitude arose in my heart as I chanted. I felt grateful for the small blessings I was enjoying right there, driving with the window down, the sun shining on my face, and tasting steaming chai from a flask. It dawned on how many things I usually take for granted—daily benedictions that sustain and nurture my life. So I stopped the car, sat under a tree, and chanted loudly. Govinda Jaya Jaya was reverberating in every cell of my body. I honored the beauty and bounty of the landscape around me. There was a group of cows grazing on the green pasture nearby, and then a young boy approached them on horseback. 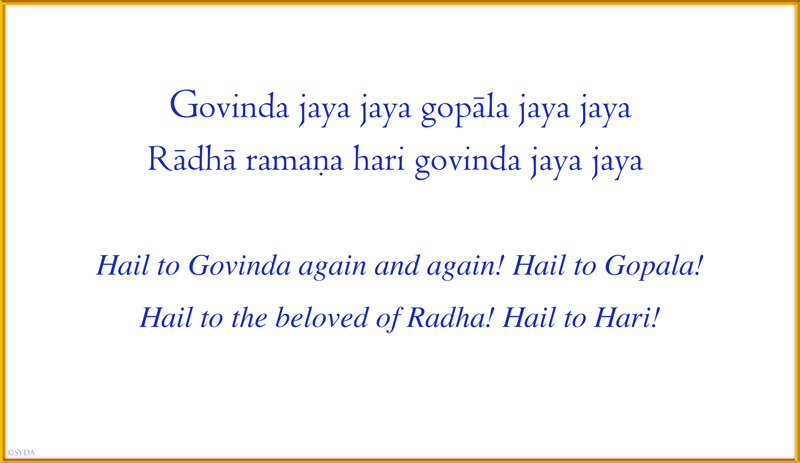 Govinda, Gopala—Hail to Hari! Thank you, Gurumayi, for the synchronistic blessings all around! While viewing the new posting and chanting Govinda Jaya Jaya, the words began dancing joyfully in my heart, releasing me over and over again into bliss. My mind was resonating with the sounds of praise and love, and at the same time, merging into the peace, joy, and happiness of the Self. I just love going to the Siddha Yoga path website for updates about the Chanting Tour. I woke up very early this morning and decided to look at the Siddha Yoga Bookstore before meditating. 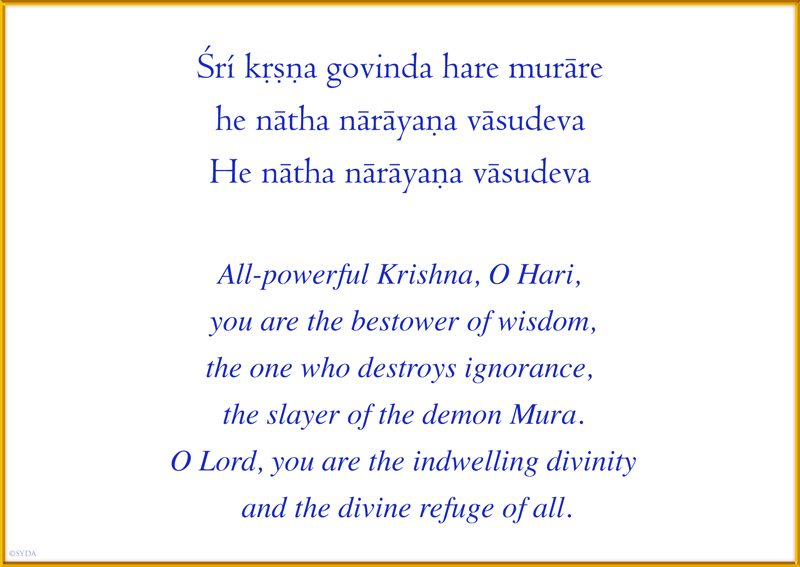 After listening to the clip from the CD of Govinda Jaya Jaya, I felt inspired to purchase it. To my absolute delight, when I came home this evening, the first words that I saw on the home page were Govinda Jaya Jaya emblazoned across the screen. What a glorious path this is! 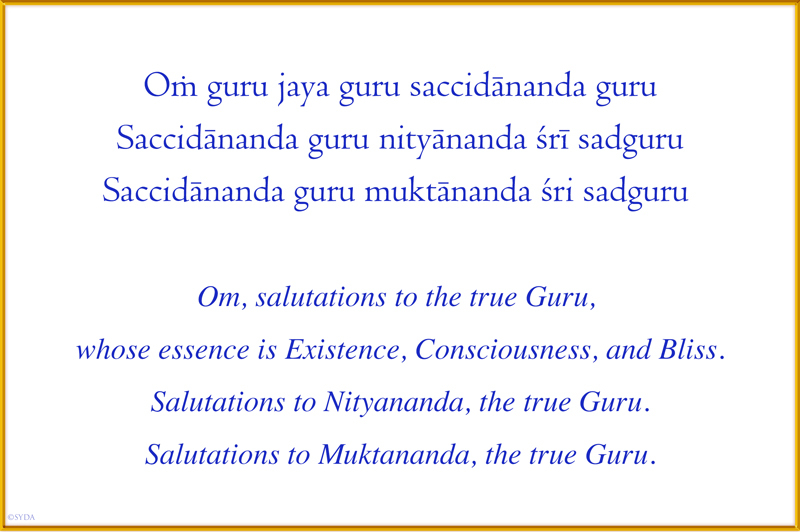 I remember this namasankirtana as the predominant chant for Baba Muktananda's World Tour that started in Australia in 1974. During that tour, thousands of people like myself, who had never imagined that God dwelt in our hearts and that we could know God, came awake to God's presence within and without through the sounds of Siddha Yoga chanting. 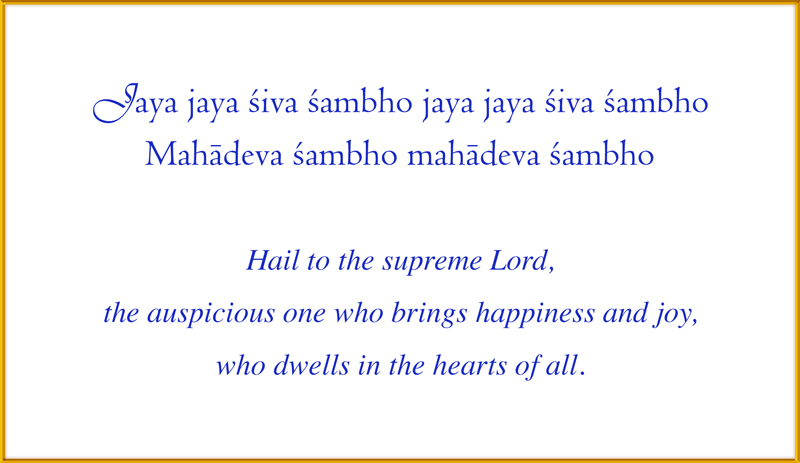 Today I woke up humming Jaya Jaya Shiva Shambho. The sweet melody accompanied me when I opened the bedroom window and greeted the sunlight, which was mirrored on a nearby soaring glass tower. The birds sang like an orchestra warming up. And even the sounds of construction outside, the crash and clank of metal hitting concrete, reminded me of bells and cymbals. What a majestic way to start the day! I feel that Shiva is showering his grace upon me, enhancing my awareness of the world around me. I perceive happiness, beauty, and benevolence sparkling within and without. Hail Mahadeva, again and again!